— This article by Jerry Cates and Curtis R., first published in July 2008, was last revised on 24 April 2016. © Bugsinthenews Vol. 09:07(10). This small snake was captured and photographed by Curtis R. in Sweetwater Texas on July 28, 2008. This snake is one of three subspecies of Diadophis punctatus that are native to Texas. the prairie, regal, and Mississippi. Two of these (the prairie and Mississippi) display a nuchal (neck) collar, while the regal subspecies does not. The specimen Curtis photographed is the prairie subspecies. Taxonomically it is a member of the genus Diadophis (from a Latin root meaning a “golden ring”), the species punctatus (from a Latin root meaning “a point”, which may refer to black spots on the serpent’s belly), and the subspecies arnyi. The subspecies was first described in 1855 by the American naturalist Robert Kennicott–b. 1835 in New Orleans–d.1866 on expedition up the Yukon River–who collected and catalogued organisms for the Smithsonian Institution in the middle years of the 19th century, and who supplied the subspecies name. Forgive this brief digression, but Kennicott, a colorful and spirited intellectual, was selected as the scientist to accompany the 1864 Western Union Expedition charged with finding a route to connect North America and Russia by telegraph. According to a recent examination of his body, he may have suffered from a congenital heart disease known as long QT syndrome (a congenital disorder characterized by a prolongation of the QT interval on ECG and a propensity to ventricular tachyarrhythmias, which may lead to syncope, cardiac arrest, or sudden death). When he died in 1866 — at the ripe old age of 30 — the cause was quite likely sudden heart failure that stemmed from this congenital condition, as he succumbed while his expedition was hiking the Yukon. Some had earlier conjectured that Kennicott was murdered, or that he may have committed suicide by ingesting strychnine, as he had been rumored to be in poor health. Others suspected his bad health had resulted from his previous membership in the somewhat infamous Megatherium Club at the Smithsonian Institution, Washington D.C., during the American Civil War. The gentlemen who formed the Megatherium Club consisted of some of the Smithsonian’s brightest scientists — many of whom had little or no formal education — who spent their days analyzing and classifying organisms at the Institution, and their nights in, as some are wont to put it, licentious revelry. They lived for a time in the residential chambers of the Smithsonian Institution itself, but were eventually evicted from those suites by Joseph Henry, the Institution’s secretary. Henry complained that their sack races in the Great Hall, and their frequent serenading of his daughters, were — ahem — disruptive. But, back to the snake specimen at hand: According to Werler & Dixon, in their book, Texas Snakes, published in 2000, this snake is uncommon to rare in Texas. 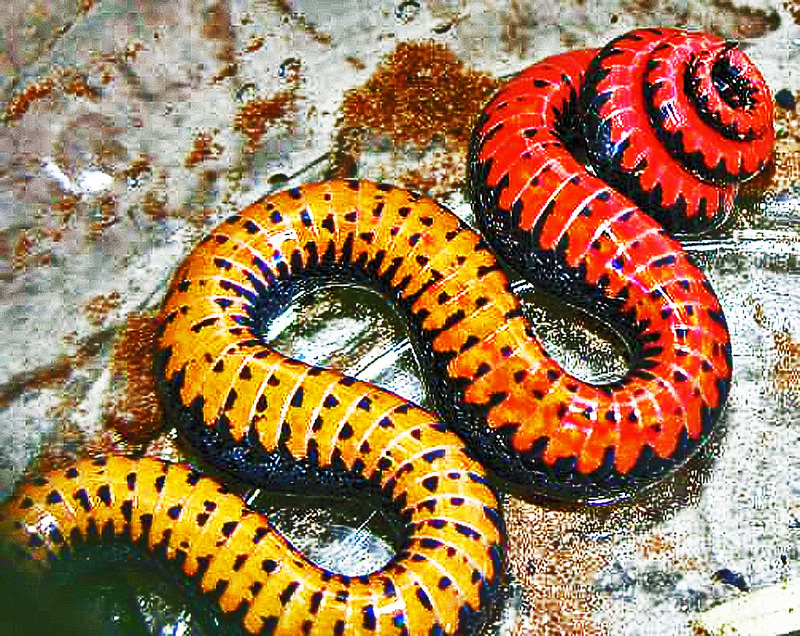 It is a gentle serpent that rarely bites defensively, but when provoked hides its head and raises its tail, curled in a tight spiral, exposing a bright red underside. 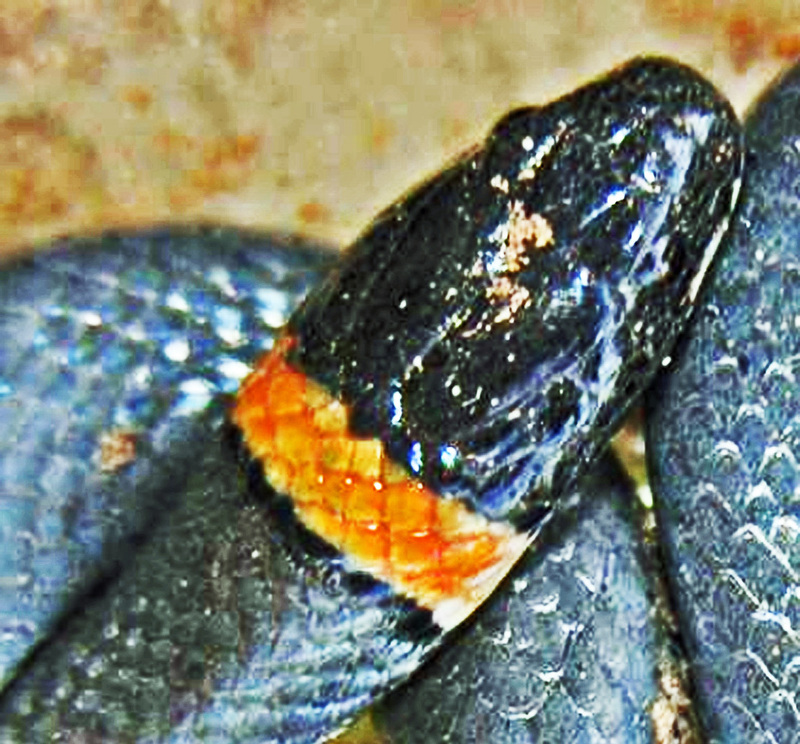 The prairie ring-necked snake is a small serpent whose head is scarcely wider than its neck. It rarely bites defensively. Instead, when molested by a large animal or by man, it often plays dead, flopping on its back, as this specimen did when attacked by Curtis’s dogs. Yet, this shy and ostensibly harmless snake is somewhat venomous. See, for example, O’Donnell et al. Its Duvernoy’s gland secretions are known to have phospholipase A2 activity, and accelerate the removal of one of the two fatty acid units in envenomated tissue, leading to tissue breakdown. This chemical reactivity is similar to that found in many viper and elapid venoms. O’Donnell notes that, though the 1950’s the colubrids (nearly all non-venomous snakes, along with those that do not possess highly developed venom glands and fangs, are casually lumped together as members of the family Colubridae) were thought to be entirely non-venomous. Today, 36 of the 320 colubrid genera are known to contain at least one serious-to-moderately venomous species, and some 1.5% of colubrid species, including several found in North America, are at least nominally venomous. 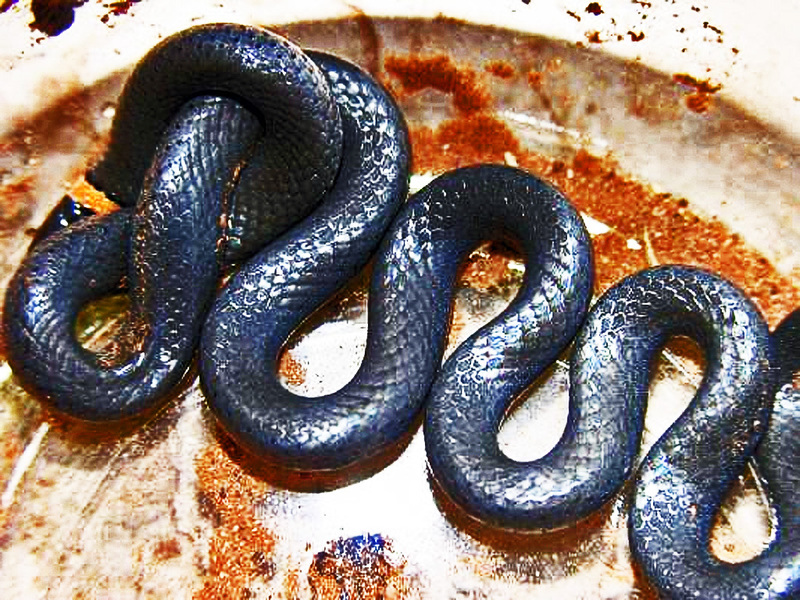 The ring-necked snakes, then, are “technically” venomous, yet their gentle and shy demeanor, and their aglyphous (from the Greek glypha, “to hew, cut”, negated by the suffix a, thus meaning unhewn, or more specifically, solid and unspecialized, in contrast to the state of being grooved or hollow) teeth, lessen the likelihood than a handler might suffer an injurious bite. Children are more susceptible, and for that reason many authorities feel it is unwise for a child to handle any snake. Detailed information on this snake is provided in Werler & Dixon’s book, Texas Snakes, pp. 90-98 (hardcopy ed., pub. 2000). There the authors note that the prairie subspecies (Diadophis punctatus arnyi) has a bright yellow belly that grades to pale orange and finally to a scarlet red undertail, with small dark spots spaced on the belly at random. The regal ring-necked snake (D. punctatus regalis) lacks the nuchal ring, but has a belly coloration and spot pattern similar to that of its prairie subspecies relative. The Mississippi subspecies (D. punctatus stictogenys) has a nuchal collar, but its belly is bright yellow from neck to tip of tail, and the dark belly spots are in irregular pairs down the belly. But why such bright colors? Imagine the cost, to the serpent, to maintain this distinction as a part of its molecular DNA script. Such distinctions do not survive into posterity when they are not useful to the holder, but they become important elements of what makes that organism unique when they happen to further its proliferation. Thus, it is wise for us to expect this coloration to have a role to play in the survival of the species. 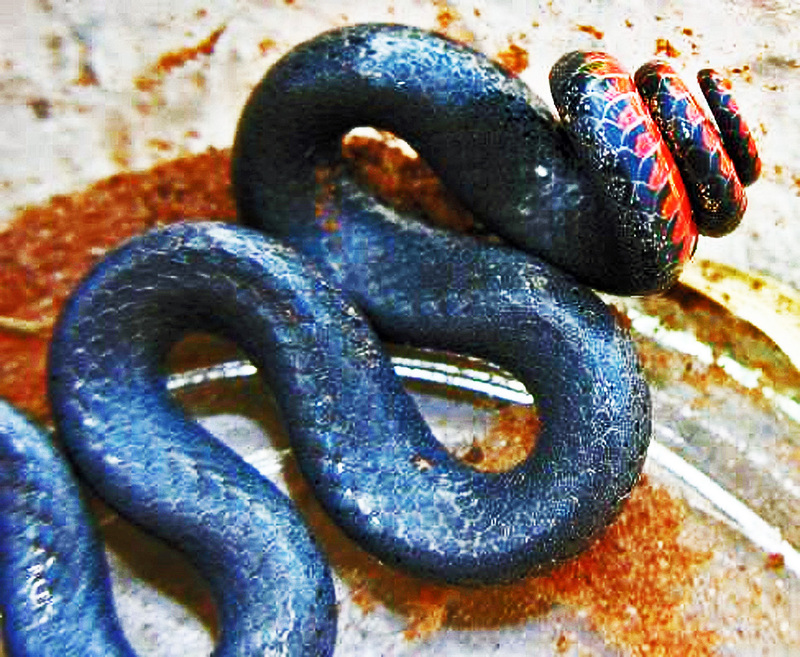 When threatened, the prairie ring-necked snake spirals its tail and lifts it upward to show a scarlet underside. This, some authorities believe, has the effect of startling a predator, or at least of diverting attention from the head, which It hides under a portion of its body during the tail display. A delay of even milliseconds in the predator’s attack can make a marked improvement in the ability of prey to escape. And, as they say, it isn’t necessary to be fast; the important thing is to be faster than other prey nearby. Additional comments on snakes in the genus Diadophis are published in Harry W. Greene’s book SNAKES, The Evolution of Mystery in Nature (pp. 105, 106, 108, 111, 113, 131, 136, 138, and 205, in the 1997 edition). The genus Diadophis has but a single species, punctatus, which is found only in North America. Thirteen subspecies are recognized, and geographical and age-related differences have been observed in their behavior. Compelling evidence exists that this snake has evolved effective defensive patterns that serve it well when under attack. Greene (ibid, p. 111) recounted witnessing such a snake being mouthed for more than five minutes by a captive kit fox (Vulpes macrotis) with no ill effects. Curtis R., who took these photos, reported the same exercise for this specimen, which had been the subject of considerable mouthing and tossing by several excited dogs. Greene (p. 113) suggests the colorful ventral flash helps this snake avoid injury (to its head) from scrub jays and similar birds. Thanks for the info. I caught one of these yesterday in Liberty Hill, TX (Williamson County, north of Austin) and had no idea what it was! Thank you for your info on the markings of this little guy. I couldn’t find out anything till now. I found it slithering around in my bathroom. I’m sorry to say that it won’t just be playing dead.